Last Monday, April 20, three people in a parked car on the 5400 block of South Ellis Avenue were shot and wounded. This marked the second Hyde Park shooting in eight days, after a man was shot on 62nd Street and Ellis Avenue on April 12. This particularly violent week in Hyde Park has sparked discussion regarding this year’s seemingly higher crime rate near campus and whether it will change student habits and policing in the area. Graduate student Xinzhu Zhou, whose apartment directly overlooks the area where the shooting occurred explained, “I have always been very cautious when walking in Hyde Park, but there is only so much you can do about it.” Due to several recent robberies around her street, she will be moving next year. Violent crime, which primarily includes murder, assault, and battery, has fallen drastically in the Hyde Park-South Kenwood area in recent years: between 2009 and 2013 the violent crime rate dropped 31 percent, according to a 2013 University of Chicago Police Department (UCPD) safety report. 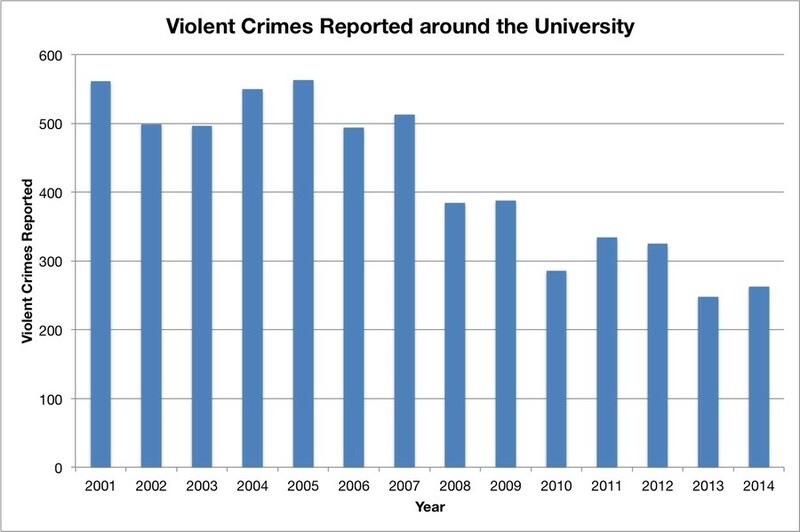 While the violent crime rate remains far below that of 2009, 2015 has seen a slight rise in crime compared with recent years. Two shootings in a single week, or even a month, is unusual for Hyde Park. In the first half of 2014, the Chicago Tribune reported, only one person had been shot in Hyde Park. In all of 2014, the number rose to four. So far in 2015, three people have been shot in Hyde Park during the month of April. In spite of this year’s increase in violent crime, Hyde Park’s crime rate remains drastically lower than nearly all other neighborhoods on Chicago’s South Side, including Washington Park and Woodlawn, which immediately surround it. Compared with this year’s three shooting victims in the University area, and last year’s four victims in total, 18 people have been shot in Woodlawn this year, and 49 were shot last year, according to the *Chicago Tribune*. Washington Park’s numbers are similar, with 12 victims so far this year and 45 total in 2014. This may be due in part to the UCPD’s extensive presence in Hyde Park and the South Kenwood area. Illinois holds some of the strictest gun laws in the country, with particularly stringent local laws in Chicago and Cook County. Illinois was the last state to pass concealed carry laws in 2013. To obtain a concealed carry permit, residents are required to undergo rigorous training and background checks, and registration for the permit comes at a high cost, the Washington Times reported last year. Regardless of these laws, the city remains one of the most violent in the country. Gun rights advocates point to the fact that residents in Chicago’s most violent neighborhoods, including Englewood, West Englewood, and West Garfield Park, hold the fewest concealed carry permits in the city, as they cannot afford the high cost. Residents in more affluent areas, where crime rates are lower, hold the highest number of permits, according to the Times. As summer approaches, which is typically the most violent season in Chicago, students remain concerned about the recent spike in Hyde Park crime. Yet Zhou believes the problem in the immediate campus area can be improved. “Campus police can rearrange their patrol area and put more focus on places where students tend to go a lot and are not that safe,” she said. Meanwhile, the UCPD is continuing to investigate the cause of recent shootings and working to prevent similar occurrences.